There is the first time we go abroad, and the first time we go to Provence,” wrote British journalist and critic Cyril Connolly in his 1938 autobiographical book Enemies of Promise. Some twenty years later, writer Lawrence Durrell – who made Provence his home for 30 years, at a time when it was still an uncharted tourist destination – was equally enchanted by the Mediterranean landscape. The vines, he observed, were “glittering green bundles softly powdered by the gold dust of the summers”. Fortunately, some things never change. 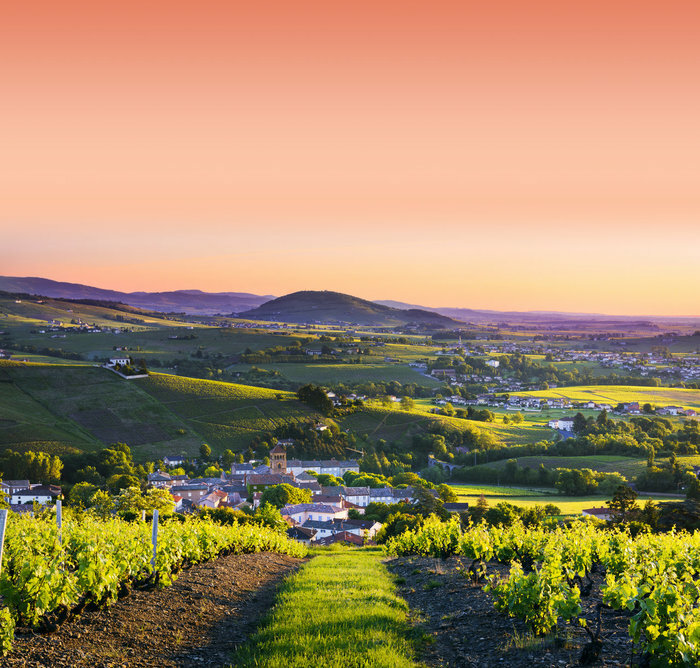 These days, the vineyards are going stronger than ever, with award-winning rosés that are like drinking sun out of a bottle. And despite the inevitable gentrification of certain villages and the ebbing stream of Peter Mayle-infatuated tourists, here’s the good news: there is a still a wild side of Provence with timeless pockets of spectacular countryside. A former New Yorker, I moved to the south of France nearly three decades ago. Yet, bizarrely, in all this time I had only experienced a resplendent lavender field once, in July 2001, at the Plateau de Valensole – and even then only in passing, en route to Moustiers- Sainte-Marie. It was unexpectedly postcard-perfect. I finally grasped what all the fuss was about and resolved to return to Haute-Provence in the summertime. But then, the notoriety of that site exploded. It was featured on every travel channel worldwide. Today, you’re likely to see tour buses parked by the side of the road and encounter the brouhaha of excited Chinese tourists brandishing selfie sticks. In peak season, any hopes for a quiet meditation amid all this natural beauty may well become slightly compromised. So when France Today magazine invited me to join them for the company’s inaugural travel tour, ‘Provence Dreams’, I jumped at the chance to leave the palm-fringed coast behind and spend a few days under Durrell’s “taut wind-haunted blue sky” in the northern part of the region, between Manosque and Forcalquier. 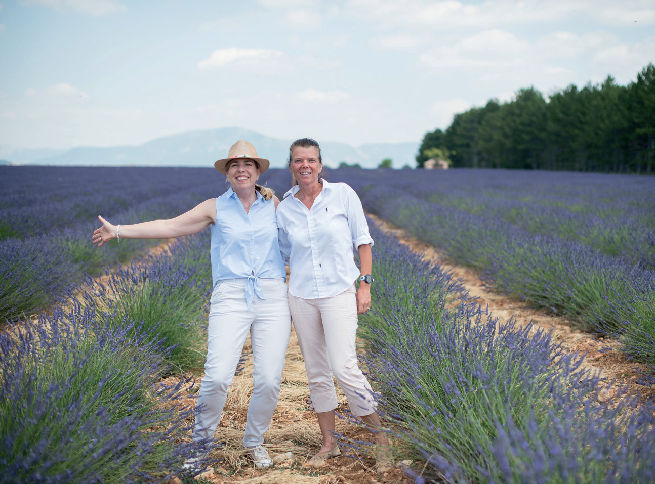 On the itinerary was the tantalising promise of a visit to secret lavender fields, plus a total immersion into the various and varied uses of Provence’s much revered fragrant flower. To begin, we would be spending a few nights hidden away in the village of Mane at the Couvent des Minimes, a restored 17th-century convent surrounded by verdant terraced gardens and fruit groves. The mini-van rolled in just in time for an apéritif and a crash course in how to play pétanque, taught by two strapping young locals, Johann and Jean-Marc. 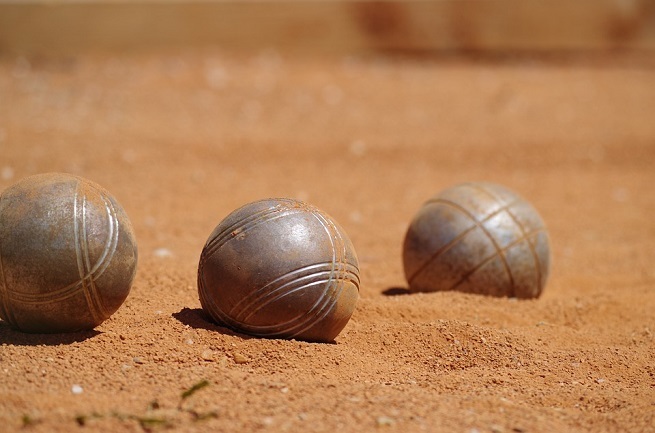 Grouped at little tables under the shade of a towering plane tree next to a strip of dirt, we listened bemusedly, drinks in hand, as Johann launched into the nuances between Italian bocce, the French game of boules and its southern cousin, pétanque. You never really understand a game until you try it, so I set down my kir, stepped onto the court, nervously gripped the silver ball and aimed. A total embarrassment as a bowler, I turned out to be a natural pointer (as opposed to a shooter). After years of shrugging it off as an old-timer’s game, I could see the enormous appeal. “Even the tiniest Provençal village will always have two things: a World War I memorial plaque and a pétanque court,” said Johann. Their enthusiastic coaching got us all into the team spirit, but 13 games seemed de trop. We had already worked up an appetite. Dinner was served on the modern white-on-white terrace of the hotel bistro, Le Pesquier, which is headed by talented chef Jérôme Roy, who dishes up tasty regional specialities – try the artichokes with fresh goat’s cheese, the tender braised lamb shoulder with carrots and ginger, and the terrific almond paste Calisson mousse with poached strawberries for dessert. 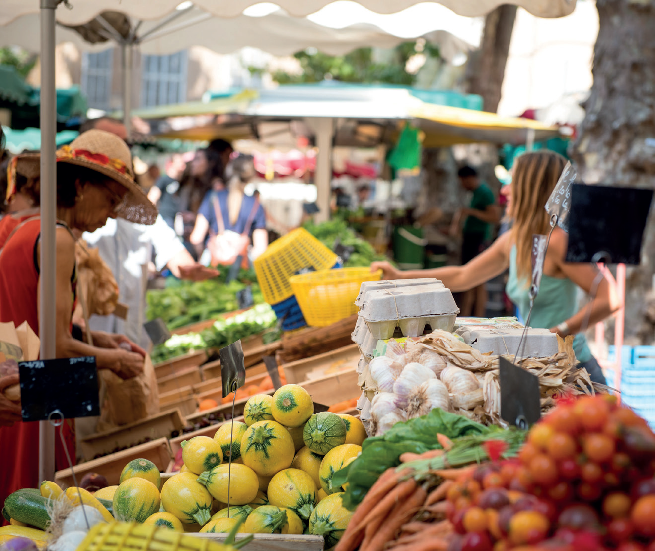 The next morning was market day in nearby Forcalquier, a pretty hilltop village. On the way, we passed the small town of Volx, where the now-international herbal beauty line L’Occitane was first created by local botanist and globetrotting entrepreneur Olivier Baussan in the early 1980s. then fried in olive oil). Before every one scattered to explore, Jennifer steered us over to a farmer’s goat’s cheese booth, where a smiling, sun-wizened paysanne laid out a variety of soft, white, round pats, explaining the ageing process and evolving textures and tastes. We sampled the ultra-fresh little mounds – a mouthwatering soft cloud on your tongue – then went on to taste noticeably sharper week-old cheeses. Next stop was lunch at a country auberge for an initiation to the joys of lavender-infused recipes. Glimpsed from the cypress-lined road, you might mistake the private restaurant, L’Orangerie, for a veritable 18th-century bastide, but this majestic ochre- and green-shuttered farmhouse was entirely restored and stylishly outfitted by Dutch-born resident chef Joyce Borgmann. Inside her exquisite country kitchen (a frequent backdrop for L’Occitane photo shoots), Joyce welcomes small groups for cooking classes followed by convivial buffets on her shade-dappled courtyard. I could already imagine the dubious reaction of some of my male friends; the very idea of lavender-spiked dishes would conjure a sweet, cloying, feminine aroma, something akin to munching on soap. But the subtle flavours of the feast spread before us would have changed anyone’s mind – chilled melon gazpacho with crushed lavender, baked aubergine sprinkled with lavender and the Orangerie’s own olive oil, a deconstructed ratatouille with crushed lavender, and luscious, thinly-sliced duck with baby potatoes and figs, all baked in lavender honey. Lulled by the thrumming cicadas, we lingered over espresso and a refreshing lemon-lavender flan. “And now for the secret fields…” Joyce announced with a grin. And so we piled back into the mini-van. After a 30-minute drive past rolling green hillsides, we veered off onto a small dirt road – one lone oak tree, a cloudless blue sky, and a vast expanse of purple stalks in symmetrical rows, swaying in the wind. There was utter peace, aside from the low drone of buzzing bees. With no trace of modern civilisation, this spot must have looked exactly the same 300 years ago. As I stood there gaping at the hypnotic vista, Joyce handed out lavender ice-cream sandwiches – a thick drippy slab of heaven between two home-baked lavender cookies. We gobbled them up, ooohing and aaahing, but mostly just looking at the view. I vowed to record this moment, hoping I could push the replay button inside my head whenever I was stressed or caught in rush-hour traffic. Day three was our final foray into the soothing virtues of lavender at a local distillery. First was another trip to a secluded private lavender field dotted with wild red poppies and the blue-grey peak of Mount Ventoux in the background. This time, everyone took turns with a sickle while our field guide, Andreas, supervised the harvesting of lavandin stalks, as it had always been done by hand before the machines came along. “Do you want to see the difference between lavender and lavandin?” Despite the heat, we nodded eagerly and trotted up the sunbaked hill to a small patch of deep violet flowers that only grows above the altitude of 600 metres. “This is what they use for luxury perfume and aromatherapy,” Andreas explained, handing me a stalk. I took a deep whiff. It was stronger, yet more subtle than the paler lavandin commonly put into soaps and essential oils for its healing qualities. Back at the distillery, the heady bunch of flowers we’d just hacked were thrown into an alembic, a rudimentary steam machine, to make essential oil, reminiscent of a mad scientist’s invention. As they cranked up the temperature, the intoxicating camphor aroma filled the room. As I left with the gift of a perfect little vial of freshly distilled essential oil, I could hardly wait to test out its legendary properties: a dab on the pillowcase for deep sleep, a few drops in the bath to unwind, and a watered-down spritz on my ironed sheets for a waft of Provençal summer. Call it deconstructing a cliché but, thanks to our privileged encounter with a fragrant sea of purple and the verve of the people we met along the way, I truly understand why writers wax lyrical about this very special place under the sun. 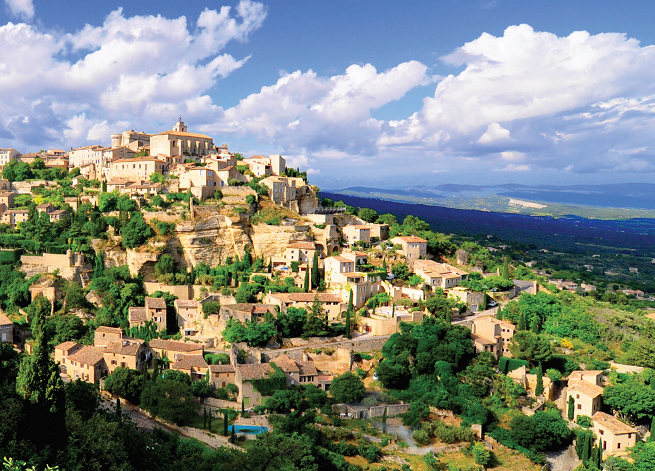 Interested in an unforgettable Provence experience? 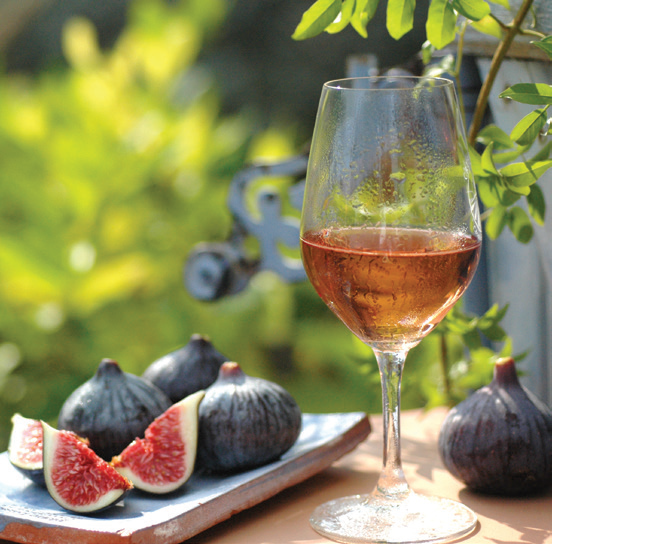 France Today Travels have just TWO ROOMS LEFT on their Magical Provence tour this year. BOOK NOW to avoid disappointment. At Las Pastras, they also do grape stomps(great fun) and olive picking. 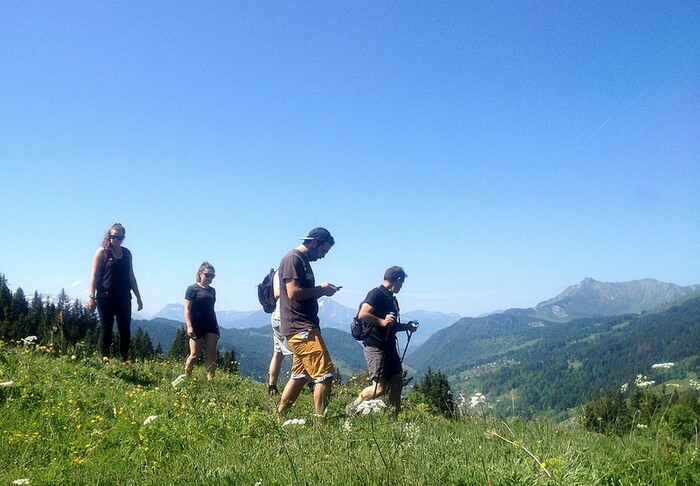 We have done both with Lisa and Johann Pepin and these turned out to be trip to France highlights!